Bicycle Touring Around the World: Bonjour France! 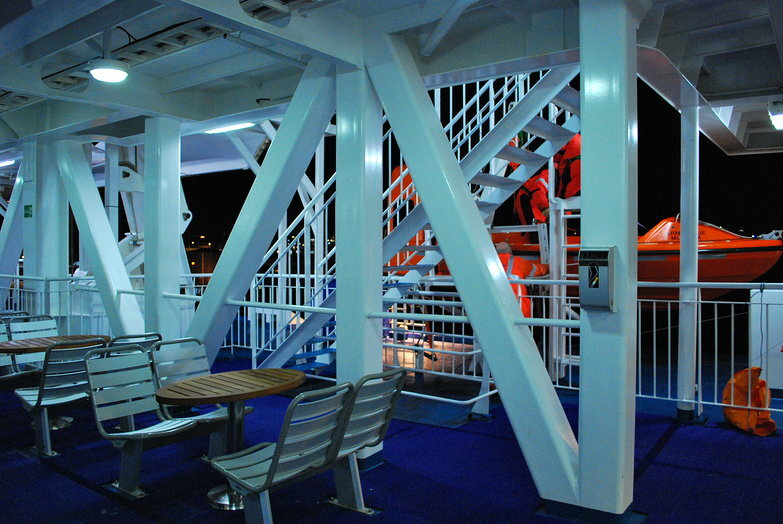 We boarded the ferry at midnight and immediately felt like we were on some sort of cruise ship. There were boutiques featuring fancy perfumes and chocolates, and a voice came over the loud speaker enticing children to buy a giant chupa-chups (lollipop) if they wanted an additional "five chupas free!" Masses of French teens, returning from their class trip to England, stood in line to buy the suckers and other treats like super sized toblerone chocolates. The ship was huge, there were even two onboard movies theaters! We had fun exploring the many different levels and sections of the ship, and then spending a few minutes outside in the night air, watching the boat cut through the dark water, bringing us ever further away from shore. After our little adventure, we made our way to our reserved seats. The reclining chairs we booked (the cheapest option) turned out to be incredibly uncomfortable. We wound up in a tangled and contorted mess in the narrow space on the floor between our seats and those in front of us. We listened to my favorite ambient/drone/meditative music (Gas' album, "Pop") while drifting in and out of consciousness for most of the ride, unable to get any real sleep. When our ferry docked at 7:30 AM local time we bought a small breakfast, groggily disembarked, and waited in line to go through customs. They saved us for last, stamped our passports, and we rode into Roscoff to get our bearings. Arriving in our first French town together was exciting. We did a few loops of the main streets looking at the shops (most had yet to open) before we stopped at a Boulangerie and bought croissants, a "patte a l'ours" (bear paw—a pastry with sugary filling) and a baguette. I felt a bit rudderless in the bakery trying to understand what everyone was saying but Tara took care of everything. After enjoying our fresh "viennioseries" while sitting on a park bench overlooking the the ocean, Tara promptly strapped the baguette she'd just purchased to back of her bicycle while looking mighty pleased with herself. 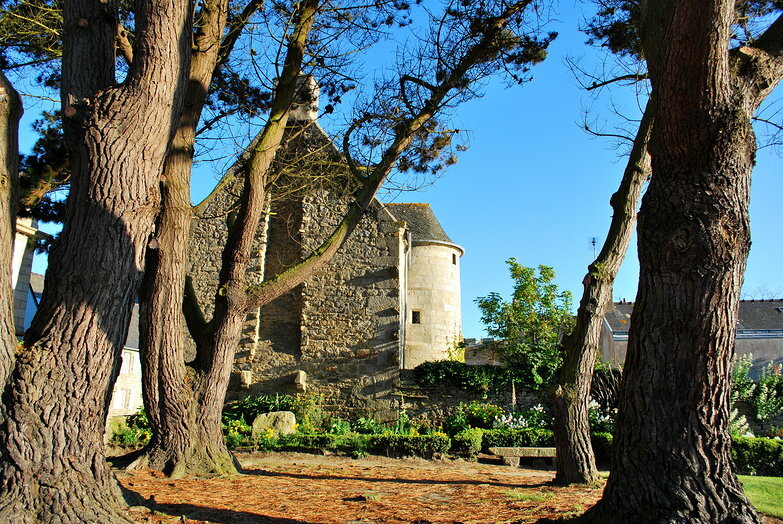 With fresh air in our lungs and delicious food in our stomachs we felt a bit more lively as we cycled out of Roscoff on the "right" side of the road. After spending 60 days doing things the British way it was surprising to me how odd it felt to go back to what I've known my whole life. I think it will take a day or two of undoing before things become second nature again. We didn't spend much time on the road as our campsite was less than 20 kilometers away, an intentional decision on our part. We wanted some time to get things in order and settle in. 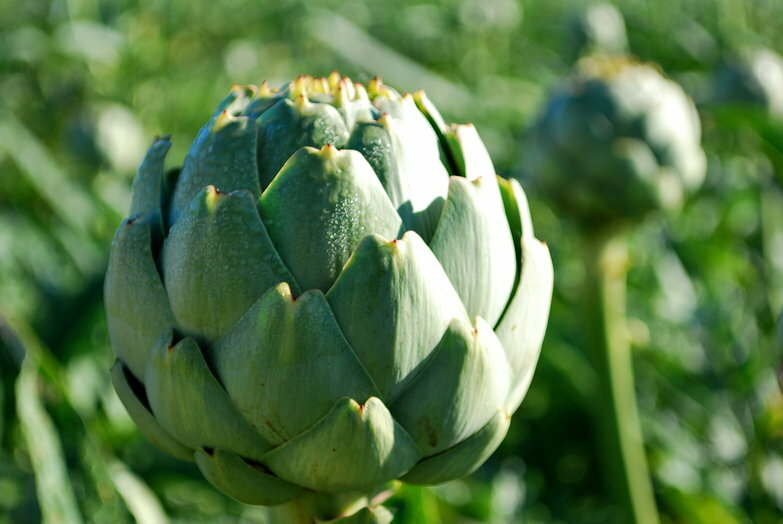 On the way we passed several odd (to me) looking fields of artichokes! When we arrived at camp we discovered a note affixed to the door of the reception office saying that the people who ran the site lived just down the street in a house with blue shutters. We found the house and Tara easily struck up conversation with the owners while I stood around feeling a bit like a child. The campsite owners were very friendly and gave us a discount, along with my first Breton crepes! As we were cycling off to set up our tent, the woman came running back and told Tara that she was going to do some grocery shopping in the village and asked if we wanted a ride. We thanked her and after dropping our stuff off, she came and picked us up. We bought a few supplies at the supermarche (food seems more expensive here so far) and I spotted a power adapter that might convert the three-pin caravan plugs we see at campsites everywhere to a regular jack we would be able to plug our laptop and other electronics into. I didn't buy it, but we might come back to look at it later. When we returned we set up camp in a sweltering field of hay under a ridiculously sunny sky. I was so hot I jokingly asked Tara if there were clouds in France. She miserably replied "of course" through her non-stop sneezing fit (complete with runny nose and itchy eyes). We added "visit the pharmacie for antihistamines" to the list of things we needed to accomplish today, along with getting our internet situation sorted out. With home assembled, we rode our bikes 15 kilometers along a beautiful, flat coastal road into Morlaix, a large-ish town where the woman in the bakery this morning had told us was an Orange Mobile store. They sell a dongle similar to the one we used in the UK. When we arrived I kept an eye on the bikes while Tara negotiated the situation in French. Orange offers two dongles on pay-as-you-go plans, neither of which requires signing a contract. However, one of the plans was pretty much useless to me, and to buy the other, the one I need for work, you need to have a french address and bank account! That particular Orange store didn't even have them in stock anyway, so we made a few game plans for acquiring one before cycling a few kilometers to another Orange store (in a shopping mall) to see if they had any. After much ado we found the shopping mall and Tara ran inside while I again watched the bikes. The Orange employees were unhelpful but she emerged with a huge smile on her face. She had found another company, SFR, who provided a similar service, with slightly cheaper rates, and we didn't need to have a french bank account!! We locked the bikes up, and I went inside with her to get the whole scoop. Excited to have my work situation sorted for the next two months, we got out our wallet to pay, and then their computer system crashed. After all of our searching, we couldn't even buy it! Ugh. Rather than give up completely we wandered around for a bit, waiting to see if they would get their computer issues sorted. No dice. They closed up shop for Saturday, and were going to be closed Sunday and Monday. Merde. A bit dejected, we biked 15 kilometers back to our campsite. Tara made french onion soup for dinner. Since she couldn't really smell or taste much with her nose all stuffed up, she accidentally made it way too salty. She couldn't tell, and I thought it was perfect! After dinner we did the usual—read, journalled, cuddled and watched House (we're almost caught up!). I cannot describe how thankful I am that Tara is here with me. Being in France is going to be a very humbling experience. It is a very odd feeling knowing that I cannot communicate with almost everyone around me. I know that my French will improve and that I will get more comfortable with not knowing everything that is going on, but in the meantime I feel somewhat useless. I am not at all accustomed to having other people take care of me and even less so needing to be taken care of. I have a very type-A personality, the amount of trust I am placing in Tara is huge. Thankfully, I can think of no one else in the world I would rather do this with. So far I feel a bit lost but Tara merrily chats away in French, navigating us effortlessly along and I get to relax a bit! Tyler, gardent votre menton vers le haut, tout sera bon ! Ooh, good to hear from you! France is one of my favourite countries to read about, so I am looking forward to hearing all about it! Hehehe, the SFR vs. Orange thing sounds pretty french to me. I was going to buy a SFR SIM card for my phone until their computer system crashed, so I had to get Orange. When frustrating things like these happen, you just have to shrug your shoulders and eat more delicious cheese, wine, bread, and meat and it won't seem so bad. Get used to needing a french bank account to take advantage of many important services. It's french bureaucracy at it's best. Also there are about 10 bank holidays a month! Hopefully we won't need to use any other services then! could you give me a good route to travel across France i'm planing road trip to see as much of France as possible. That is a tall order my friend! 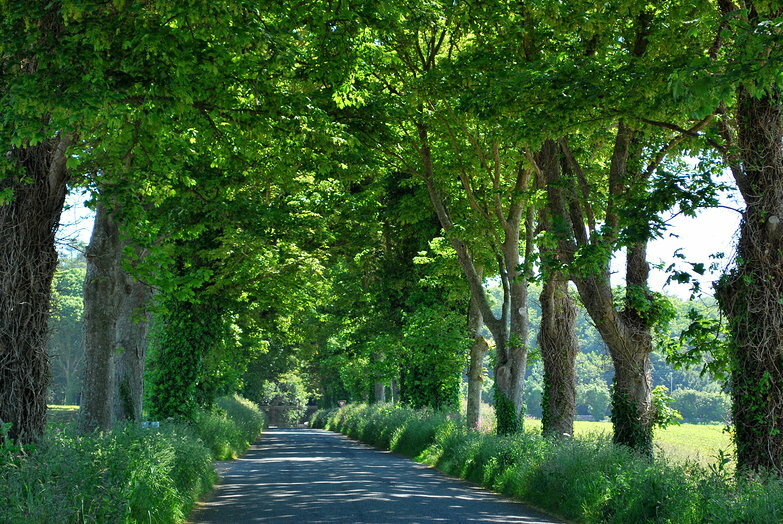 There is so much to see in France that it would be very difficult offer a worthwhile answer. We love Rough Guides and their book for France would surely help you more than we ever could. Good luck with your road trip!